PayPal has just launched an upgraded iPhone application that adds new features and includes a facelift that’s meant to help instill a greater sense of security. And it also brings with it big news for Bump Technologies, the startup that lets you exchange information simply by tapping smartphones together: Bump is now prominently featured in the PayPal iPhone application as a quick way to initiate transactions. You can download the free app here. PayPal has offered a free application for the iPhone ever since the App Store launched in mid-2008, and it has gradually been improving over time. Today’s release brings a handful of significant new features. 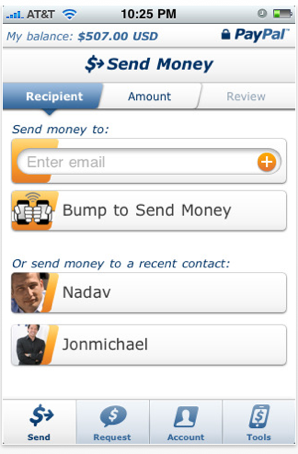 First, it now allows you to send a money request to your contacts (it’s essentially a bill). Second, you can now withdraw money out of your PayPal account and deposit it into your bank account. And there’s the Bump integration, which allows you to exchange money simply by tapping two iPhones together and entering the amount of the transaction — finally, an easy way to collect money from those friends who always seem to be out of cash. The PayPal app includes a few more minor new features. There’s now an integrated tip calculator and bill splitter, as well as a reminder function that alerts you when you need to send or withdraw money. And the application now integrates the ‘PayPal For Kids’ program, which allows kids and teenagers to access a PayPal sub-account that’s linked to their parent’s. PayPal’s iPhone app is only one component of the company’s mobile strategy. Last spring it partnered with RIM for the launch of the BlackBerry App World store, and it has also integrated with eBay’s mobile application. iPhone developers can easily integrate PayPal functionality using a PayPal library. And aside from the iPhone app, it offers native PayPal applications for Android and RIM phones as well (the company plans to brings these apps up to speed with the new iPhone release over the next few months). This is also obviously very big news for Bump, which is still a young startup (the company took part in Y Combinator and was funded by Sequoia last fall). Bump and PayPal declined to disclose the details of the partnership.